Sgt Raj Kishore Sahu was born on 29 November 1971 in Cuttack in Orissa. Son of Mr Krishna Chandra Sahu, Sgt Raj Kishore Sahu was unmarried and had no siblings. He was enrolled in the Indian Air Force on 03 August 1989 and became a Flight Engineer on 24 May 1997. He was a very sincere and dedicated flier with a total 360 hours of flying on MI-17 to his credit. 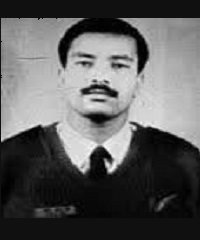 Sgt Raj Kishore Sahu was always enthusiastic about undertaking flying missions and was meticulous in his approach. He served in many Air Force stations all over India and was posted in both Mi-8 and Mi-17 Squadrons besides working on the technical maintenance team for MiG-27 aircraft at a forward fighter base in the eastern region. During 1999, Sgt Raj Kishore Sahu was serving with No 152 squadron Helicopter Unit , operating Mi-17 helicopters. By May 1999, a large scale planned infiltration by militants backed by the Pakistan army, had been detected in Uri, Batallik and Drass sectors and Indian Armed Forces were ordered to clear the areas of the intruders. Along with the operations by the Army, IAF also undertook air operations to meet the objective. One such operation was undertaken by 152 Squadron in Drass sector. On May 28, Sgt Raj Kishore Sahu was was flying as a flight Engineer of a Mi-17 helicopter , piloted by Flt Lt Muhilan during an attack mission against ground positions strongly held by Pakistani infiltrators in the Drass sector. The enemy forces were well entrenched and were equipped with anti-aircraft guns and surface to air missiles to take on possible air attacks. The Mi-17 helicopter repeatedly carried out attacks in the face of fierce enemy opposition in the form of ground fire and missiles. Unfortunately in one of retaliatory actions by the enemy forces his helicopter got hit by the U.S made Stinger SAM(surface to air missile). Since the helicopter took a direct hit the damage caused was massive and the aircrew had no time to take any emergency manoevres. The helicopter crashed and the valiant air crew comprising Sqn Ldr Rajiv Pundir, Flt Lt S Muhilan, Sgt Raj Kishore Sahu and Sgt PVNR Prasad were martyred. Sgt Raj Kishore Sahu displayed exemplary courage and bravery of the highest order. While in the face of intense enemy opposition, he carried out his functions in an exemplary fashion significantly contributing to the effectiveness of the crew as a whole. Sgt Raj Kishore Sahu was a valiant air warrior and a committed soldier who laid down his life in the service of the nation. Union Minister of State for Coal Dilip Ray donated Rs 100,000 from his personal account to the father of sergeant and flight engineer Raj Kishore Sahu. On public demand, Ray also sanctioned funds from his Member of Parliament’s relief fund for the construction of a ‘martyr pillar’ in memory of Sgt Raj Kishore. Proud of Indian air force. Saheed sergeant Raj Kishore sahu you always give us inspiration .you may not forgotten from our heart.your sacrifice for our people may wrote with golden latter of our hystory.